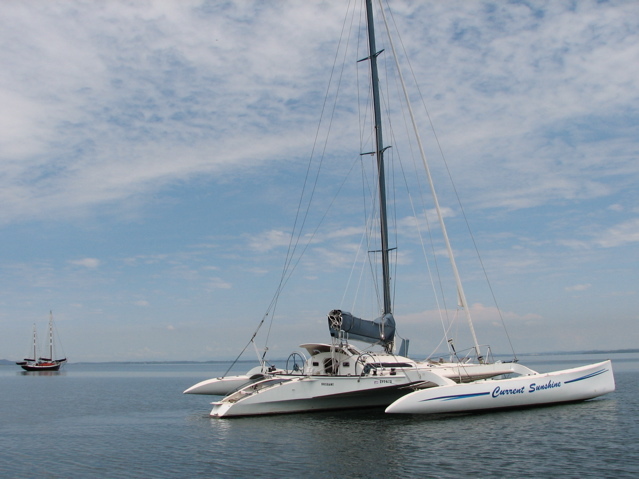 My trimaran is now sold to my mate Tony and and its time to repurpose this website. The name Current Sunshine was intented to represent the source of fuel to run the trimaran — that is, from today’s sunshine, as opposed to ancient sunshine that we use from fossil fuels. The name Current Sunshine encapsulates my interest in renewable technologies and my work in promoting the use of renewable energy based on its commercial credentials. There is much interest in the adoption of renewable energy for the purpose of minimising man-made global warming. This topic generates divided opinion and creates much separation and so the focus of this site will be directed to sharing other compelling reasons for using renewable energy. The use of distributed renewable energy is ideally suited for adoption in the Australian electricity grid where have large areas of sparse population and the cost of supplying electricity using poles and wires is expensive and requires large subsidies to keep prices of delivery at parity with city dwellers. Local generation and storage has commercial advantages and is being adopted by electricity distributors such as Ergon energy. In city areas the use of solar power is particular interesting for businesses where their electricity demand is largely during the daylight hours and can be substantially provided by solar power with grid backup. Prices of solar installations are falling rapidly and can supply power at about grid parity. The technology that particularly interests me at present is pumped hydro for energy storage and there is an ideal site for this in my local area. I am also interested in community engagement and connection and I wish to explore the possibility of building a hydro power station that is owned and operated by the local community. I’ll write more about this in another post soon. I´m at the moment looking for a boat for my third longer sailing adventure. One of the options would be a light 44 ft trimaran and maybe equip it with electric engine. If you would do it again, would you install a torqeedo? I have now seen their 10.0 Pod drive which also shall be generating electricity. Were you happy with the size of the battery bank? The old cruise motors also generated power — they just didn’t promote that as a feature. I saw as much as 18 amps one day for just a minute or so when the boat was doing about 18 knots in a gust. The motor was screaming and I wouldn’t have wanted to keep it going at that rate, but the gust died down soon enough. You do need some system to protect the batteries when getting regen in such a manner. The cruise 4 was underpowered and if there was a Cruise 10 at the time I would have bought that. The old cruise 4’s could let water in after they’ve done hundreds of hours and the seal deteriorates. The new one with aluminium caps have much better seal arrangement and can be replaced easily. For anyone with an old cruise 2 or 4 its important to replace the seals after 300 hours. I think the bank size was about right for my use. At low speed, say 1000 watts it had about 8 hours range. I would have liked more solar panels. You can’t have too much solar power.